Clearing our house cleared our minds. 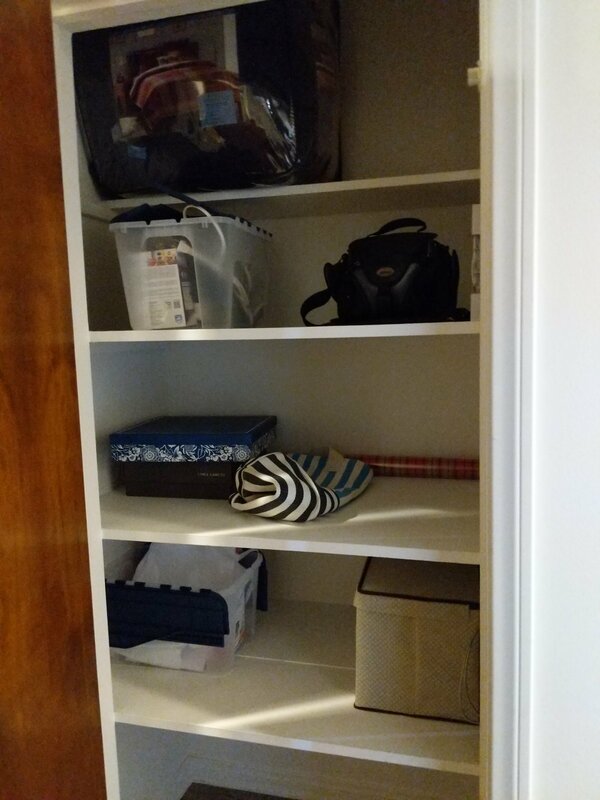 I had clothes in 2 dressers, three closets, and 6 of those canvas tote bin things. I emptied EVERYTHING into my bedroom. 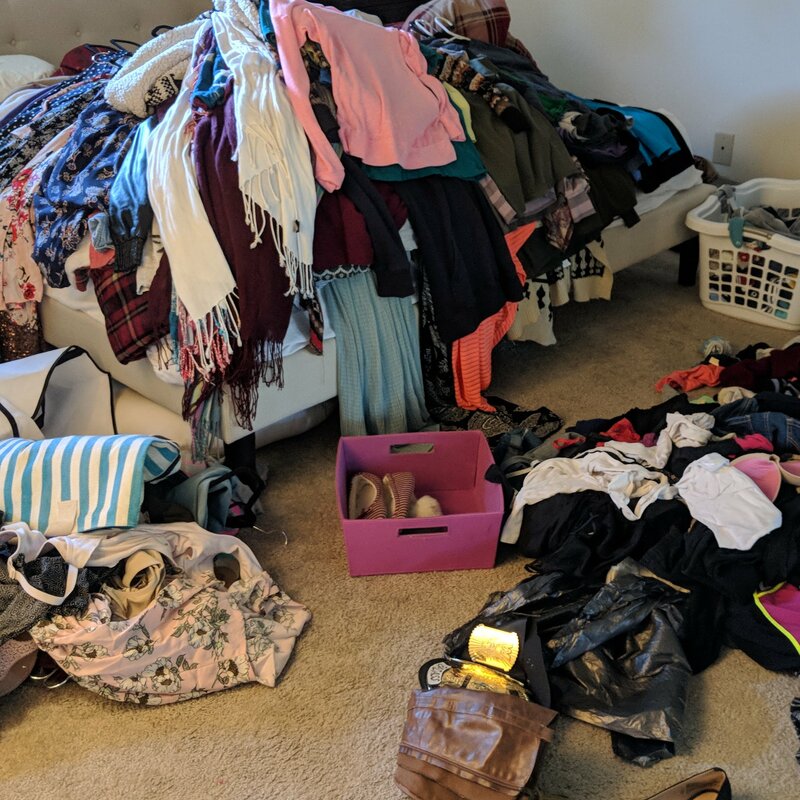 After filling 4 bags of “donate” I thought I should take a picture of what I still had left to sort through..
Ps..while we were doing this she told me she doesnt own a single pair of sweat pants…..look what she’s wearing 😂 we laughed for like 10 minutes…she is so dumb..I love her. This was hard for my mom. She thought she’d have nothing left to wear. Getting rid of stuff was so easy for me. I have very little emotional attachment to things..but I saw first hand that some people do. So if you get emotional hopefully you have someone there to help. And hopefully they’re nicer than me because I just rolled my eyes and told her to pull herself together.. 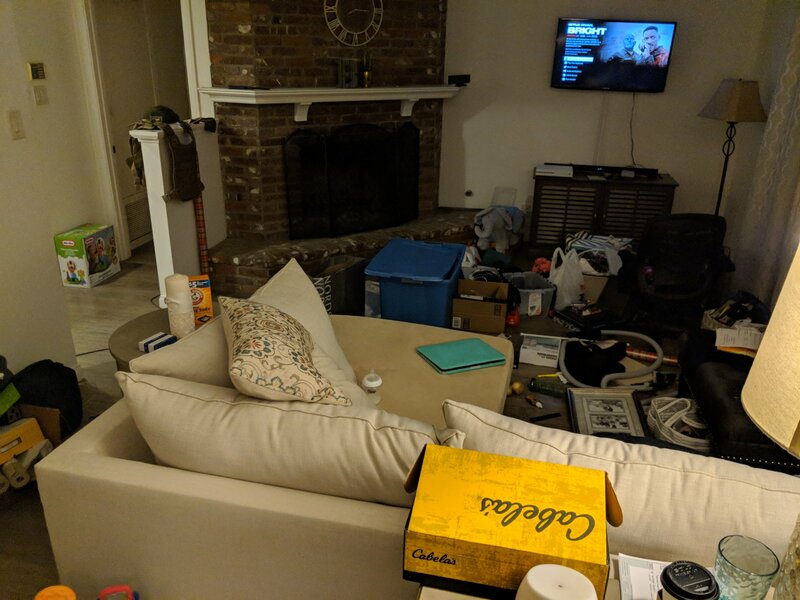 So for my own house, each day Inhad off, I chose a category (kitchen stuff, baby stuff, cleaning stuff..) and brought it all into my living room and followed my system of asking myself if it brings me joy and how useful or practice it is. 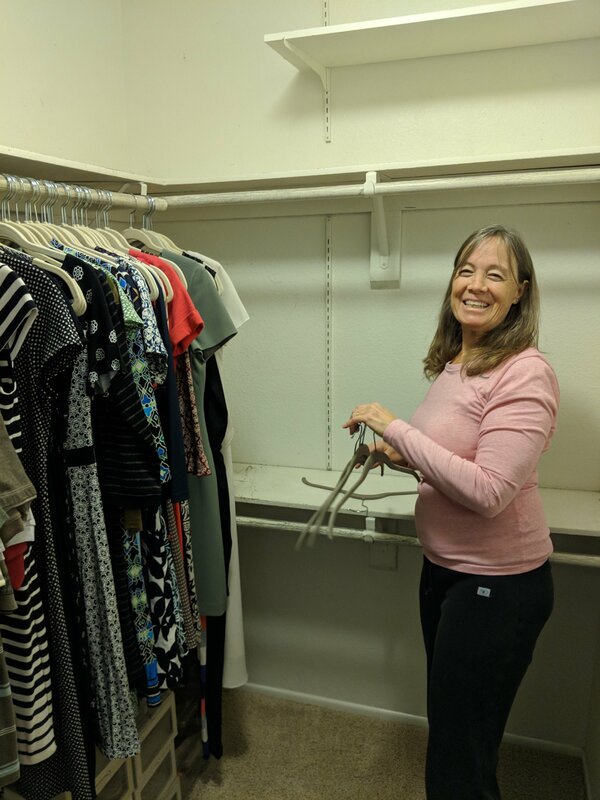 I wish I had a before picture of my cleaning closet but this after picture fills my heart with excitement …seriously …. 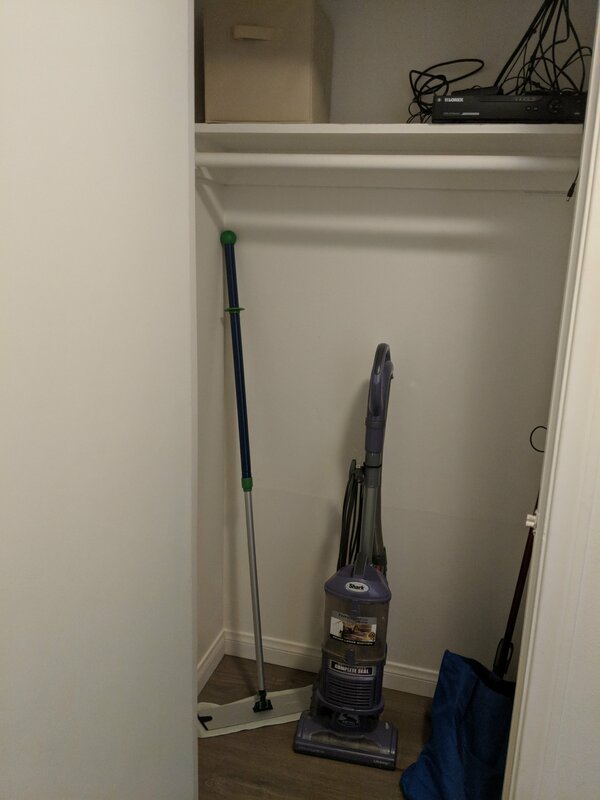 My Norwex mop, a vacuum, a broom, and my bag of Norwex cleaning stuff…up top is some carpet cleaner and cleanup bleach that I can’t quuiiteeee part with yet. But omg I love this! 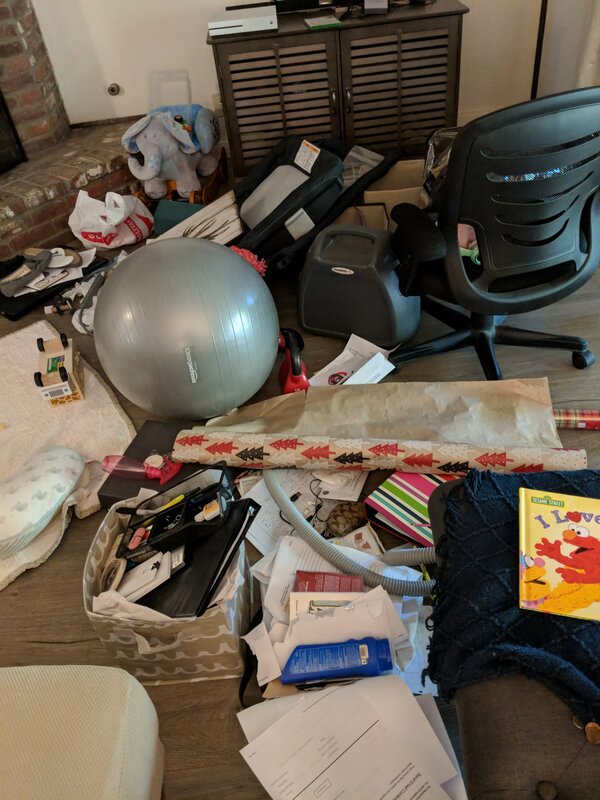 The best part of allllll of this crazy purging is that I truly love (almost…again…gotta keep tax stuff) everything in my home. 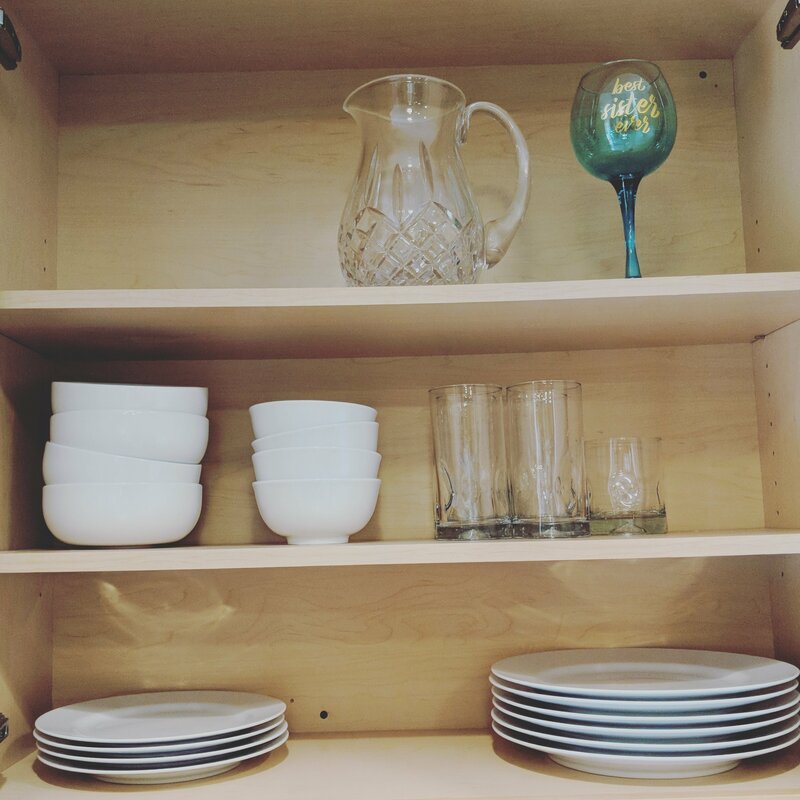 Every cupboard and closet I open makes me happy because it’s not stuffed full. I’m just in love. 1: Feeling wasteful- if you do a big, giant initial pirge..you’re going to feel wasteful. Patrick kept seeing dollar signs and wanted to sell stuff instead of donate…but I knew it would just sit in our home and we’d never sell it. He also kept saying “we just bought that!” Yes…but I don’t even really like it….sorry dude. We got in a full on argument over a roll of Christmas wrapping paper that had enough left for like 1 gift and I had a brand new roll of the same print…I won..obviously. Remind yourself that once you finish this you’ll hopefully stop buying stuff you don’t love and you won’t be in this situation again…just accept that you’ve wasted tons of money and you don’t need a stockpile of almost gone Christmas paper. 2- Feeling guilty donating gifts- this one is hard. 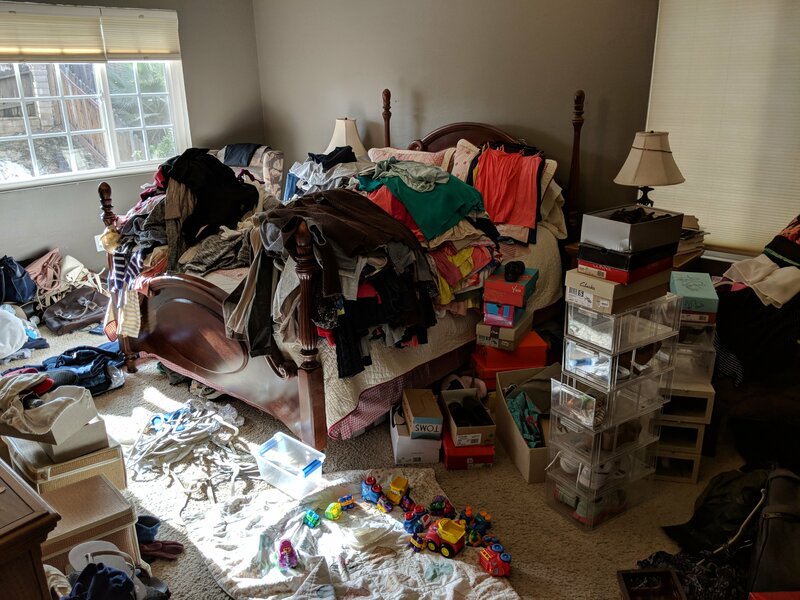 You may find something that you want to toss, but your mom, friend,sister, or whoever bought it for you and you feel guilty. Don’t! Chances are you were so happy when it was given to you. 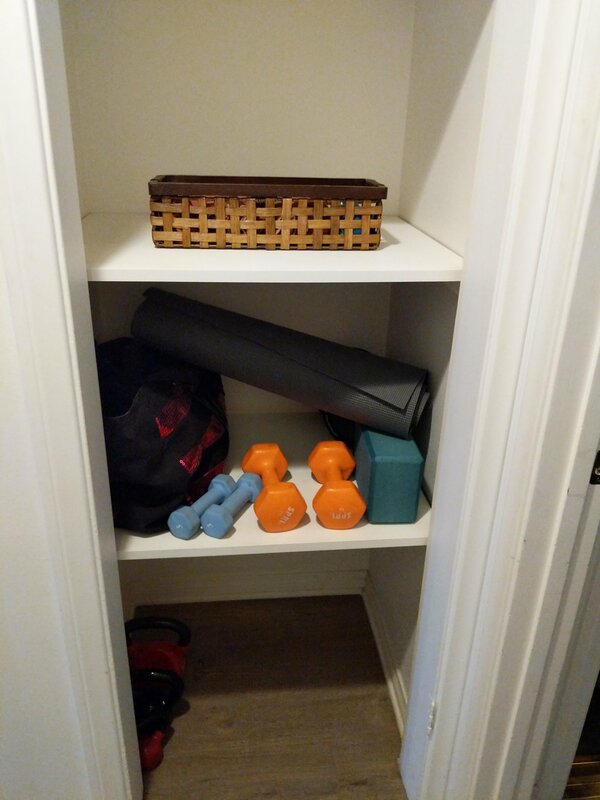 It made you happy at one point but it doesn’t anymore…it doesn’t need to sit in the back of a closet. For me this was a few Christmas decorations my mom bought me for our first married Christmas..I picked then out and loved them, but now I look at them and they just don’t bring my any joy..I had a Santa that legit looks like a pimp..how tacky am I!? . He needed to go..sorry mom..but really..why did you let me choose that?! 3- Home feeling empty- well obviously getting rid of 20+ giant trash bags of crap is going to make your home feel a little empty. For me, I actually love it. I got rid of quite a bit of home decor that I bought because “it matched” but I really wasn’t crazy about it..so my house feels very empty right now. I know for some people, this is a problem..some people like lots of decor. The way I see it is like this… I didn’t even like that stuff…I’d walk past it without feeling a thing…now I know that if I’m out and I see something I absolutely love..I’ll get it..and I’ve learned something about myself..I’m actually pretty eclectic. I really don’t care deep down if my vase, rug, and curtains go together. I’d rather have things I absolutely love that don’t match at all…but again, that’s just me. I have friends who feel joy with a perfectly decorated living room that flows together beautifully. Do you boo! It’s about what makes YOU happy. K I know this is SO long but I told you I have a million things to say!! So give me 5 more minutes of you life because I want to also share the benefits of doing this. 1- I will no longer always have “so much to do”- I am the queen of that saying! Every single day off of work..I have soooooo much to do. It usually starts with needed to clean up! I always feel like my to do list is unrealistic. My life was so overflowing with “things” I literally felt overwhelmed. 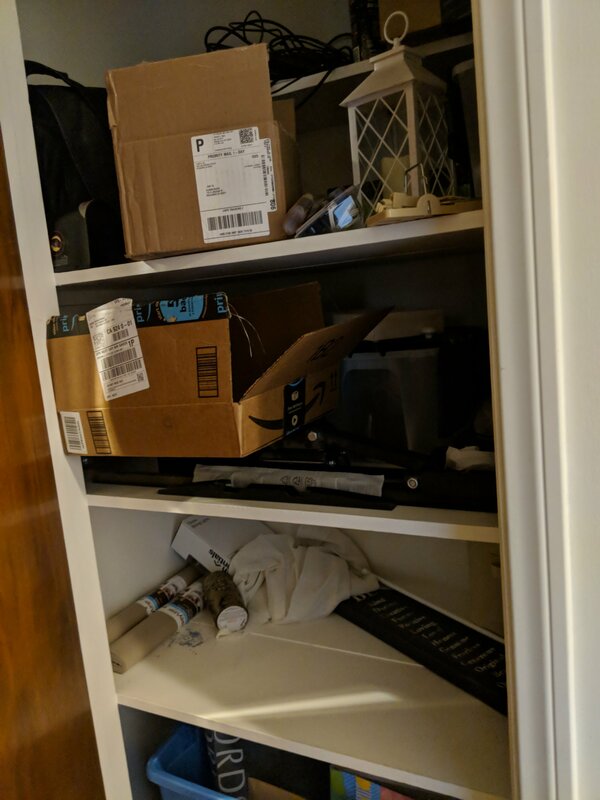 I had so much stuff that there wasn’t a place for everything… So it would be impossible for every room to be clean. My mind felt as cluttered as our house. I truly believe that if your space is cluttered..you’re mind will be too. 3- Your mood improves if you’re surrounded by things you love- there isn’t much to say here…it’s just true..
1- Too many dishes. The best thing we’ve done in our kitchen is toss a BUNCH of baby bottles. Liam gets bottles of pumped milk only when I’m gone..on work days he gets 2 usually because I come home for lunch..so we realized 25 bottles was excessive..but I HATE doing dishes so I thought a ton would be smart. Wrong. They just get so backed up! So we kept our 3 favorite and and we wash them by hand as we go. It’s been heaven!! So I think I’m ready to follow suit with our dishes. 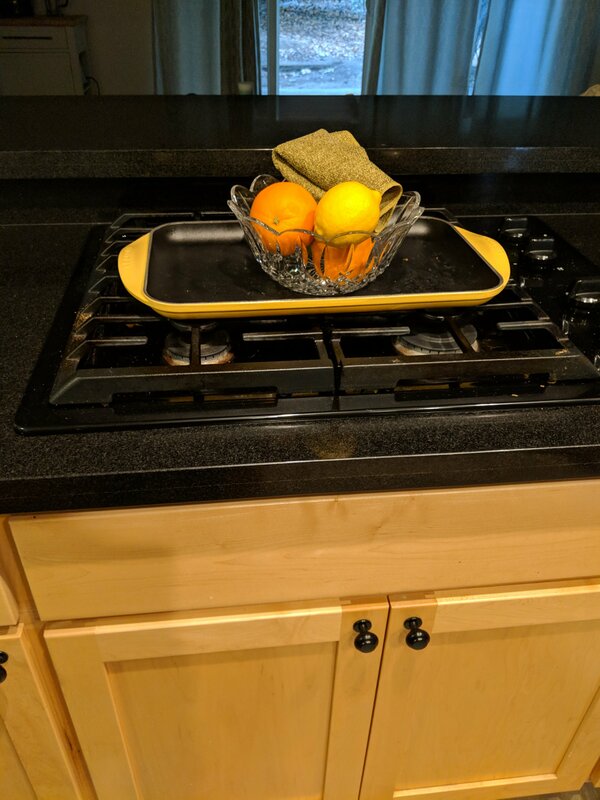 I’m ready to stop using the dishwasher and start hand washing dishes as we use them. 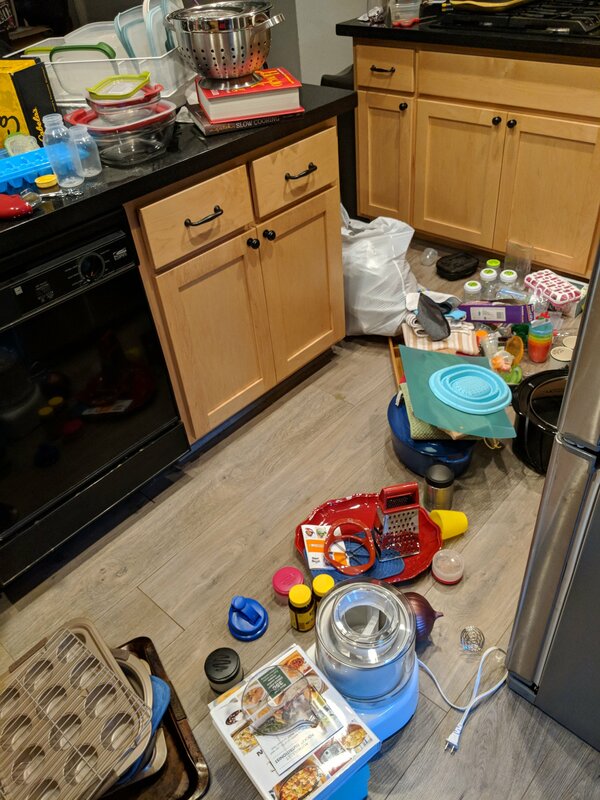 When we have 10 plates for the two of us..we wait until there are 0 left to run the dishwasher…then we use from there because we hate unloading it..sink fills up…you get the point. So tomorrow I am boxing up some dishes and keeping them in a cupboard for company. We each get 1 of each thing. Wash it when we’re done with it. I’ll let you know how this goes…pat has no idea yet…I’m just deciding this.. So I totally have more to say but this is getting ridiculous so I’ll save it for a different post. Can you tell I’ve had 3 cups of coffee already today? I fricken love coffee. Ps. Can you guys see a way to subscribe to this? I was trying to make a button so that if people want to to be notified when I make a new post, they will be. But to be honest I’ve been too lazy to mess with it 🤷. I’ll look around today…or maybe tomorrow. Below are some more pictures of our purge. In-process AND afters. If you can’t tell the difference I have a major problem lol. It has been such a good few weeks doing this! I’m juuuusttt about done with my whole house and it feels so amazing. I recommend this to everyone!